Pep Guardiola insists he will see out the remaining year of his Bayern Munich contract next season, despite reports linking him with Manchester City. Ex-Barcelona manager Guardiola, 44, is thought to be a long-term target of the Premier League side. City boss Manuel Pellegrini fears the sack if they miss out on the top four. "My future is: Wednesday free, Thursday training, and, of course, next year to be here. That's my future," said Guardiola when asked about his plans. 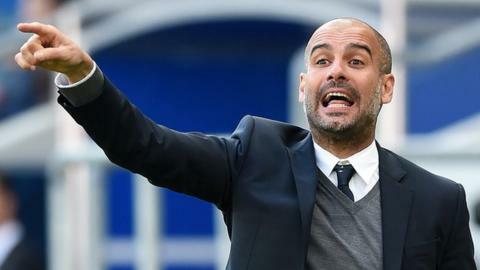 Guardiola won the German league and cup double in his first season at the Bavarian club last year and remains on target to match that achievement this term. Bayern, who are 12 points clear with five matches left, could clinch a third successive Bundesliga title this weekend if nearest rivals Wolfsburg fail to match their result. And the current holders face Borussia Dortmund in the German Cup semi-finals next week. However, their ambitions of winning the Champions League to claim the treble were hampered by a 3-1 first-leg defeat at quarter-final opponents Porto. Bayern host the Portuguese side in the return fixture on Tuesday. "This is a big club, so you can't say we are in a cosy situation," said Guardiola, who won 14 titles in four years at Barcelona. "If you win, you're a genius. If you lose, you have lots of problems, but that's the nature of my job. "I know which club I am at, it isn't enough to win the Bundesliga and the cup.